Mary Pickford with a pal, 1916. Mary Pickford was not the first movie star, but she may as well have been. After finally appearing on the Broadway stage, Pickford quickly became a favorite of audiences in the early days of short films in the Nickelodeon days. She rose to incredible prominence with the development of the feature-length film. Born to English and Irish parents, Gladys' father died when she was six. Force to take in borders, her mother let out a room to a "theatrical person" who suggested Gladys try out for a double role of a boy and a girl for a play he was stage managing called The Silver King at the Princess Theatre in Toronto. She rapidly advanced to playing Little Eva in productions of Uncle Tom's Cabin. The family toured for six discouraging years before Gladys got a role in a play William DeMille was working on for producer David Belasco called The Warrens of Virginia in 1907. Belasco changed her name to Mary Pickford. After touring in the play, Pickford was tested by D. W. Griffith at the Biograph studio in New York. She was hired and she took as many roles as they could give her. She later said, "I decided that if I could get into as many pictures as possible, I'd become known, and there would be a demand for my work." Demand indeed. She became known as "The Girl with the Curls" and "The Biograph Girl" since performers in these short films received no screen credit. 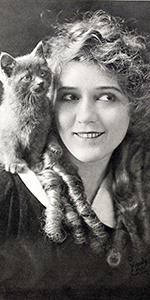 Pickford accompanied Biograph to California in 1910, but late in the year quit to go work at Carl Laemmle's "IMP" studio, but she did not care to work for the combine which was becoming Universal, so she returned to working for Griffith at Biograph, making her last film for the studio The New York Hat (released in December, 1912). By now, she was receiving star billing and a large salary. Signing with Adolph Zukor's Famous Players in Famous Plays, a major success for her was the feature Tess of the Storm Country (released in March, 1914). Pickford's combination of palpable sweetness and iron will rapidly came to reflect cinema audiences — she was them, they were her. Along with Chaplin, she became the most famous performer in films. She made $10,000 a week and half of a film's profits. She was worth it; her films pulled the rest of Zukor's film program. They put her through all the classic female stories: The Poor Little Rich Girl (released in March, 1917), Rebecca of Sunnybrook Farm (released in September, 1917), and Daddy-Long-Legs (released in May, 1919) at First-National. Big hits all. Pickford had a reputation for being a tough businesswoman, which came in handy when, with her new husband Douglas Fairbanks, Charles Chaplin and D. W. Griffith, she formed United Artists in 1919. Monster hits followed: Pollyanna (released in January, 1920), Little Lord Fauntleroy (released in September, 1921), she remade Tess of the Storm Country (released in November, 1922), Rosita (released in September, 1923), Little Annie Rooney (released in October, 1925), Sparrows (which had a huge premiere at Sid Grauman's Egyptian Theatre in May, 1926), and My Best Girl in 1927. 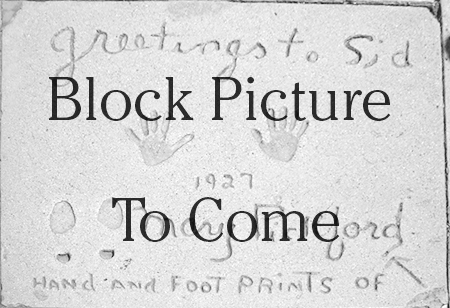 Pickford knew a good investment when she saw one, putting money into Sid Grauman's Chinese Theatre. Pickford was given the honor of signalling the beginning of the opening night performance at the theatre. 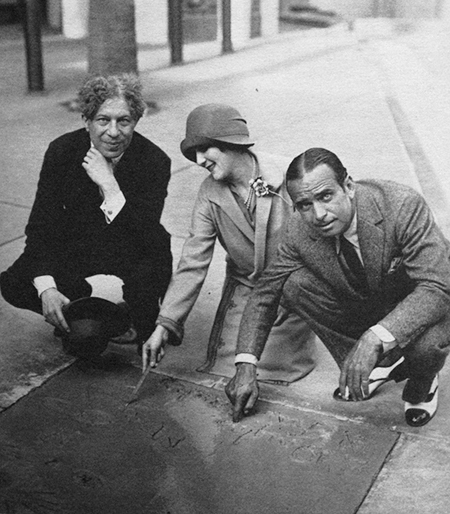 Pickford and Grauman were both involved with the forming of the Academy of Motion Picture Arts and Sciences in 1927. Although she won an Oscar for acting in Coquette (released in April, in 1929), she, like her husband Douglas Fairbanks, disliked working in sound films. Their version of The Taming of the Shrew (released in November, 1929) was not successful. Retiring from acting in 1933, she divorced Fairbanks in 1936, and married bandleader Buddy Rogers. Although she continued to produce films and oversee her financial empire, Pickford became a recluse. She received an honorary Oscar in 1976. She died of a cerebral hemorrhage in 1979, aged 87. Grauman's Chinese Theatre, Hollywood, California. Mary Pickford and Douglas Fairbanks Forecourt ceremony, Saturday, April 30, 1927. Sid Grauman looks on in this publicity photo.